Different jobs require different skills throughout a person’s career. With continuing education classes, you can learn exactly what you need to start a new job, enhance your skill set, or pursue a completely new career path. Lara Baca has been taking continuing education classes for most of her adult life, which has allowed her to develop a unique set of skills that are tailored to her professional goals. Traditional credit classes follow a structured schedule that require students to manage their time accordingly. Non-credit continuing education classes provide increased flexibility that make going back to school a much easier process for busy adults. “I love continuing education because you can go whenever you want to enhance your life,” says Lara. 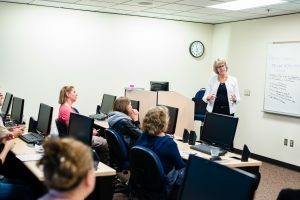 Many classes at Bellevue College CE are offered throughout the year and have start dates at various times over the quarter so that students can pick and choose what fits best with their schedules. Are you ready to learn something new? Take a look at fall quarter classes enrolling now. Register online or with Customer Service at (425) 564-2263.